CARINO LC is a tool to unleash people's creativity and inspire development and creation of products related to cars. CARINO LC allows to monitor and change the behaviour of your car. It allows to collect and send information within two data networks that exist in the car - CAN (Controller Area Network) and LIN (Local Interconnect Network). In addition to that, it allows to control and monitor electrical systems that are not connected to these networks. This is especially useful for older cars with less sophisticated electronics. The board is compatible with Arduino IDE. This will allow you to start using CARINO LC very quickly. Also, it has Arduino Mega compatible connectors which means you will be able to connect existing LCD display, WIFI, GSM or any other shields to expand the possibilities of your projects. Bluetooth connectivity, will make it easy to make a wireless connection to your phone, tablet or a PC. Dual CAN bus will allow you to collect data from separate CAN networks. Also, you will be able to alter the CAN messages by connecting the CARINO LC between two CAN nodes. Single wire CAN bus (SWCAN) support gives opportunity to connect the board directly to low speed SWCAN bus that is available on many modern cars. Micro SD card support allows recording of acquired data. Two high power outputs allows to control high power devices such as relays without any extra electronics - directly from the board. High voltage analog input will give an opportunity to measure voltages up to 24V. Measuring car battery or any sensor output voltage has never been so easy! 12V tolerant digital input allows to monitor the ignition or state of any relay. 128KB program memory - write complicated program without running out of space! CARINO LC is the second generation of Elduino CAN128 platform. All known mistakes/problems have been fixed and using feedback from first customers, additional functionality has been added. 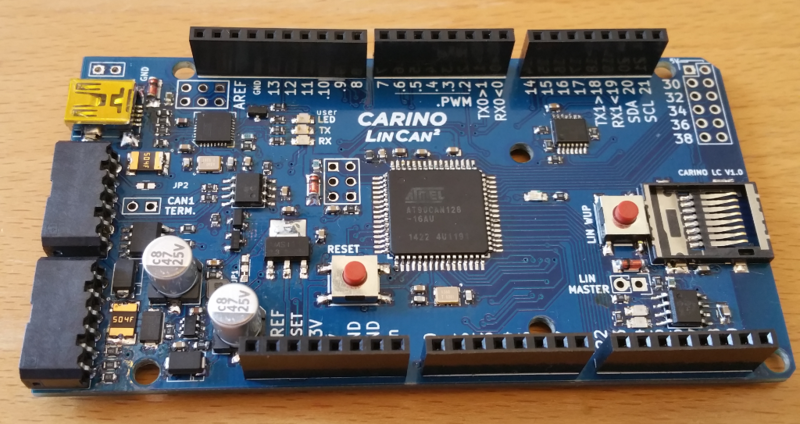 CARINO LC becomes expensive when built in small batches, so please support this project and share it with your friends. Soon we will launch the KickStarter campaign and really need your help to acquire funds for production of the board in bigger batch. Thank you! Arduino Icebreaker - make your girlfriend talk to you again!